“Scarface” is a fitting name for the most well-known Grizzly bear that roamed the vast lands of Yellowstone National Park, Wyoming. Although he bore several large scars on his face and had a damaged right ear, Scarface made it through 25 years in the park, which makes him elderly for a grizzly. He was formally known by the parks department as No. 211. But in November last year, Scarface was fatally shot by a hunter just outside the park’s northern tip by Gardiner, Mont., according to a statement by the Montana Fish, Wildlife and Parks Department (MFWPD) last week. “No. 211 was recognizable because of distinctive scars on the right side of his face likely the result of typical fights with other male grizzlies for females during mating season or to claim deer and elk carcasses,” the statement said. The MFWPD said the bear had first been captured in 1993, weighing just 150 pounds. At his heaviest, he was roughly 600 pounds. The department noted less than 5 percent of male grizzly bears “born in the Greater Yellowstone Ecosystem” make it to 25 years old. In the fall of 2015, it was predicted that Scarface wouldn’t make it through the winter—he had lost a lot of weight in his old age, falling to just 338 pounds. 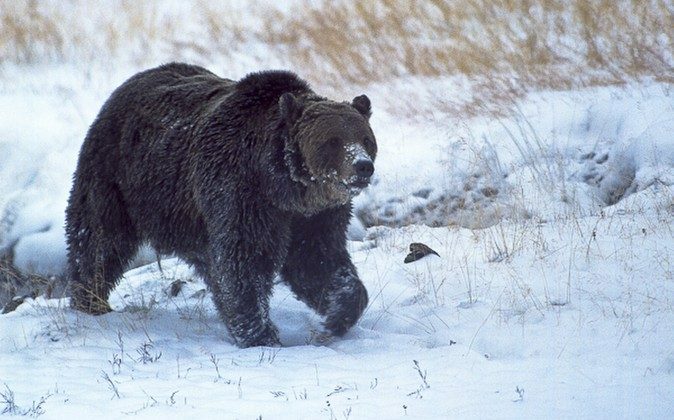 According to Yellowstone Park’s website, Scarface would’ve been preparing for his 5-month hibernation around the time he was shot. Scarface’s death sparked an investigation by the U.S. Fish and Wildlife Service (FWS).